I’m in the planning stage for starting fiberglass work on my 22 Cruiser project boat next fall. I’m trying to think of all the modifications I want to do to the hull and cabin fiberglass, particularly any areas where I can tab in reinforcement for attachment points for cleats, eye bolts, and anything else that can be used to secure or tie down cargo. 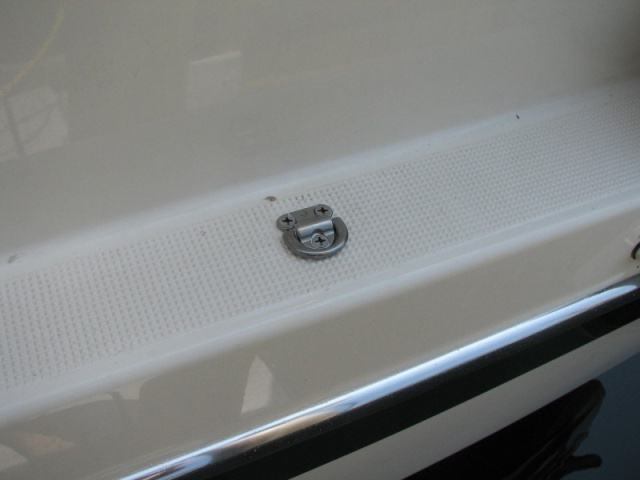 For example, should I incorporate SS eyebolts into the lower transom for trailer tie down? Are there locations where additional cleats might be handy? What about eye bolts for tie down points for securing extra fuel tanks or cargo in the cockpit during long cruises? Any other mods that would be useful? I’ve never owned a C-Dory and never cruised in my own boat, so I have no experience to tell me what features I might wish I had, when I’m finally able to enjoy the boat. Thank you for any suggestions. Paul, come up to the Friday Harbor CBGT and take a look at 50 C-Dorys. They will all be different, and all the same, so you can pick out what you like and what you think might work for you. Can't get a better selection than that anywhere. Everyone has different ideas and needs for cleats, tie down eyes, etc. The factory probably installs what most people need and leaves it to the individual to add any additional points. So the suggestion to look at a bunch of boats and talk to their owners is a good one. You can then find out what works and what doesn't. But when you install a point, there are probably two levels of strength to consider. For moderate to light loads like cover tie downs then thru bolting it with fender washers on the inside will do. 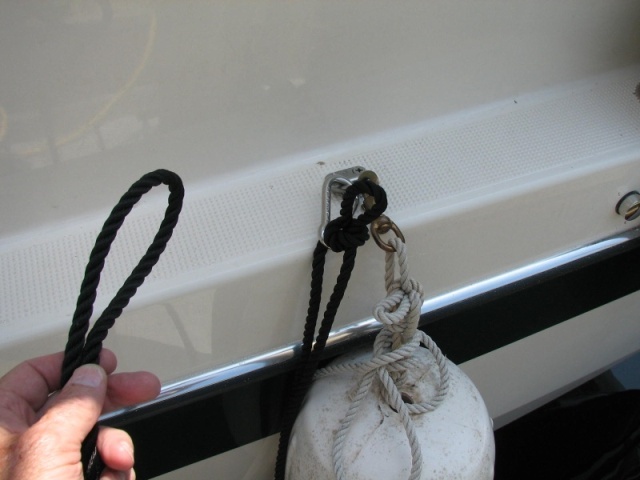 But if it is a high strength point like a boat to trailer tie down or a mooring cleat then put a backing plate inside to distribute the load. A 6" x 4" piece of Starboard or even 1/2" ply will make it a much stronger point. ...come up to the Friday Harbor CBGT and take a look at 50 C-Dorys. They will all be different, and all the same, so you can pick out what you like and what you think might work for you. Not sure I can make it, but that's a really great suggestion. ... But if it is a high strength point like a boat to trailer tie down or a mooring cleat then put a backing plate inside to distribute the load. A 6" x 4" piece of Starboard or even 1/2" ply will make it a much stronger point. Thanks David. I'll do that. 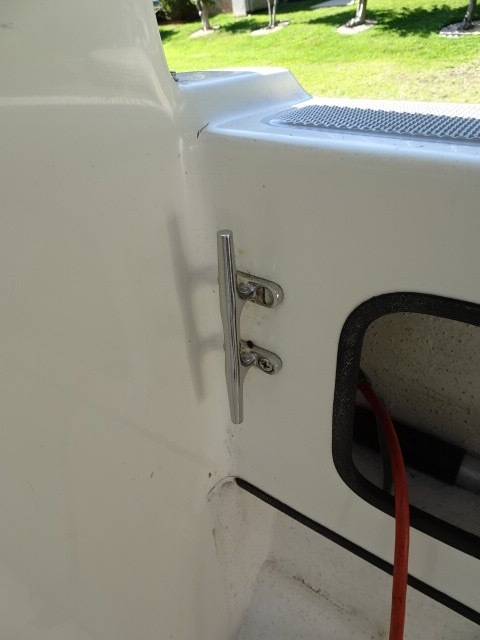 should I incorporate SS eyebolts into the lower transom for trailer tie down? Not too "lower" keep them well above the water line. My personal feeling is that a strap over the gunnels just forward of the aft deck cleats is a good stern tie down. You want to keep the boat from sliding sideways and going forward. Many of the boats already have stern tow eyes. I like backing plates to be aluminum or stainless steel/. If I use wood or other materials, I like to use "fender washers"--way oversized washers to help distribute the load. Our current 25 has 3 jam cleats on each side of the cabin side, and also hangers for the light docking lines across the aft cabin bulkhead. Sorry don't have photos of these. Extra cleats by the bow for light lines to adsorb shock on anchor rode. We have put extra grab rails in front of the galley, and in front of forward facing navigator's seat (if so equipped. We use the fittings of the Bimini top to keep chairs and other items on the side of the cockpit in place when traveling. Thank you Bob. Those are exactly the kinds of suggestions I'm looking for! 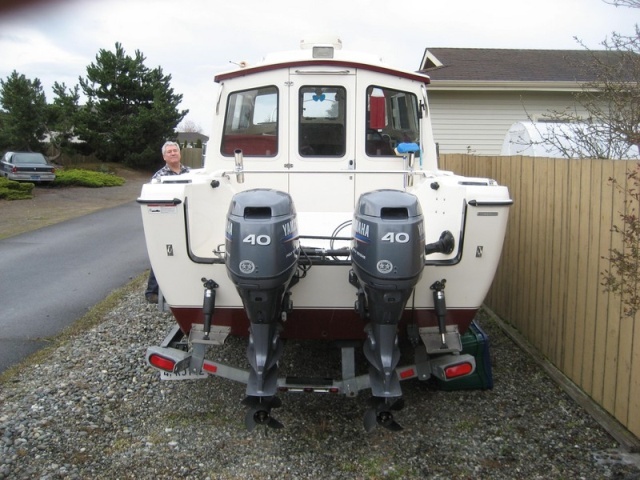 I have been looking at backing cleats and tie-downs recently and when the marine electronics tech was here I was talking with him about that and his recommendations. 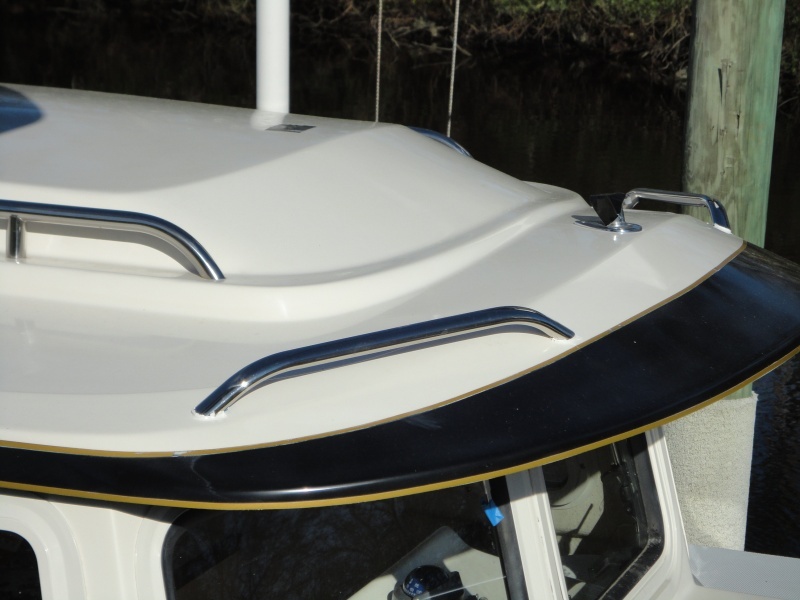 He was good with Sail or star board, Fiberglass board, or stainless, but no aluminum due to the galvanic corrosion possibility (too hard to keep it isolated from the fasteners). 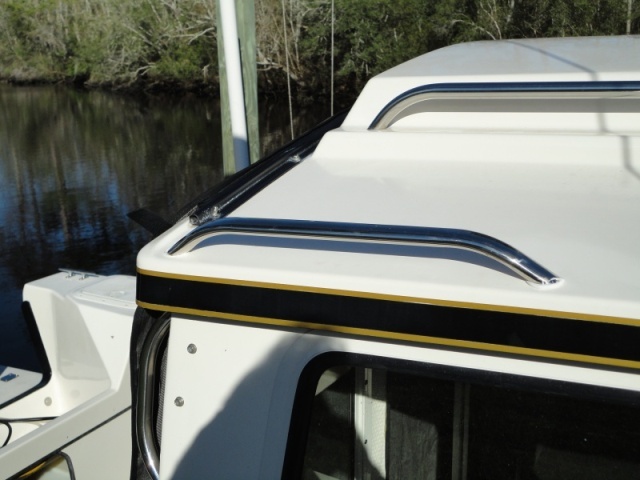 As long as you use marine grade aluminum--and in some cases just use a isolating washer--or Tef Gel anti corrosion compound it is not a problem. I have used aluminum, in multiple boats which saw a lot more rough blue water than any C Dory, including backing a SS Bow roller assembly about 36" long, x 10" wide which was removable to get the LOA of boat down to 45'. SS is not immure to problems itself. Again--the proper materials and knowledge are essential. I have also made a number of electronics brackets out of aluminum which is easy to work, and can be made much thinner and lower than the brackets which come with the electronics. What can be an issue is going to Home Depot and getting a non satisfactory aluminum (depending on use). Bob, You are right but generally, mixing metals is kin to asking for trouble. Why tempt fate. I found this photo in an album labeled "Electrolysis". 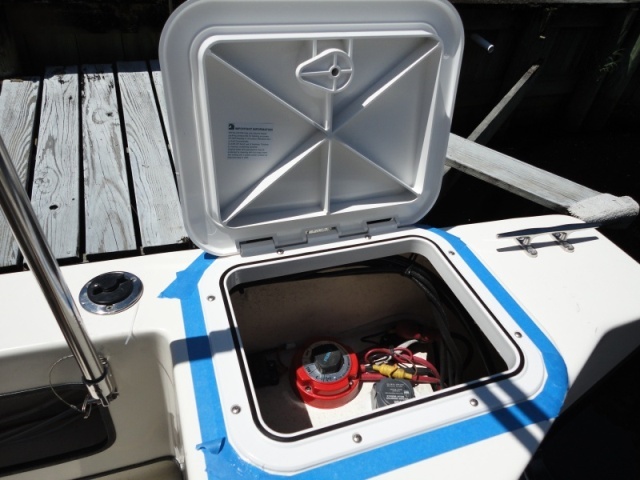 "While working on the bilge pump through-hull (on the right), I noticed some serious electrolysis on the U-bolt for the transom tie-down. "Electrolysis." What a great name for a boat. Sounds like a Greek God." Not sure why something as dangerous as this is provided by the C-Dory manufacture, but if anyone should know better, they should have. I think I will skip using aluminum, just in case. Electrolysis is the process of passing an electric current through a substance in order to produce chemical changes in the substance. Galvanic corrosion is caused by self-induced current created by electrical potential of two dissimilar metals in contact with an electrolyte. 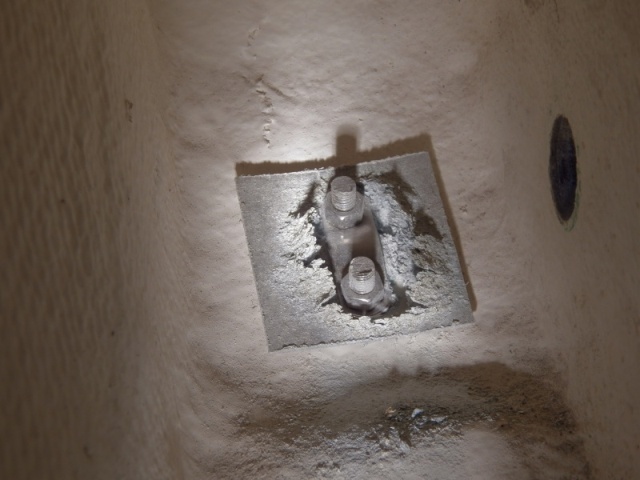 It can occur when two dissimilar metals (such as copper tube and steel pipe) are connected in the presence of an electrolyte. Fresh potable water is a weak electrolyte. Electrolysis occurs when an electrical current strays from its path due to improper wiring or a defect coming between two metals in the presence of an electrolyte, usually seawater in this case. 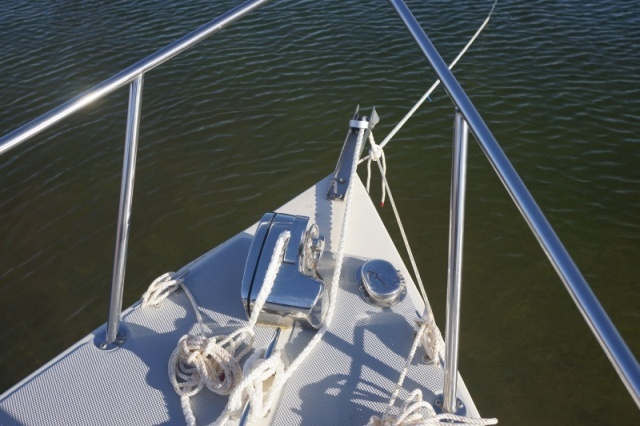 Metal hull boats are particularly at risk because the hull is conductive and stray wire or connections use the hull as a ground. The two metals can be the same or different. Galvanic corrosion is when two different metals are in contact in the presence of an electrolyte. One metal will be more chemically active than the other, and a reaction occurs. Very pure water will not conduct electricity, so the electrolyte isn’t present. Saltwater however conducts an electrical current and allows for corrosion to occur. Those who write books electrical circuits find it is very useful to differentiate, because of different causes and different "cures". The photo of the trailer is clearly rust= corrosion. I suspect that the same is true for your backing plate. Unfortunately during the Reynold's ownership of C Dory some short cuts were taken--and this is an example of one of them where some in-expensive aluminum plate was used which had minimal exposure to sea water. I suspect that that same plate would have corroded to that extent, just sitting on the deck or in the bilge. The reason for "rust" in the SS bow eye is that they used inferior Chinese Imported SS. I found many examples thru the years of this inferior SS. You may remember that I found rust on the deck fittings of my Tom Cat 255 within months of delivery--and will minimal salt water exposure. There is also crevice crack corrosion in SS. The mechanism of crevice corrosion. I have seen this result in loss of rudders, chain plates and keel boats--where the outcome is the loss of the boat.